Do we ever have a mouthwatering recipe for you today! At the end of last summer, Debbie and I were going to share a recipe for pineapple salsa with avocado with you all, but even though it tasted great at first, it got all mushy and weirdly green. Not very appetizing at all. 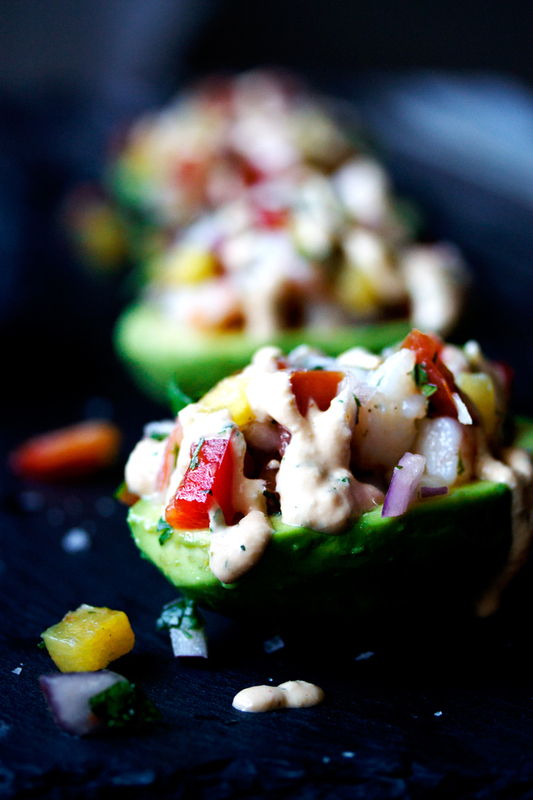 So Debbie came up with this genius idea to put the salsa inside and on top of the avocado. She’s not just a pretty face, people! They look so beautiful with those vibrant colors and the presentation is like an art piece. How impressive would these be to place in front of your guests at a dinner party? 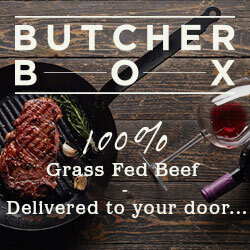 And when they take their first bite, they will really be impressed because these taste AMAZING! 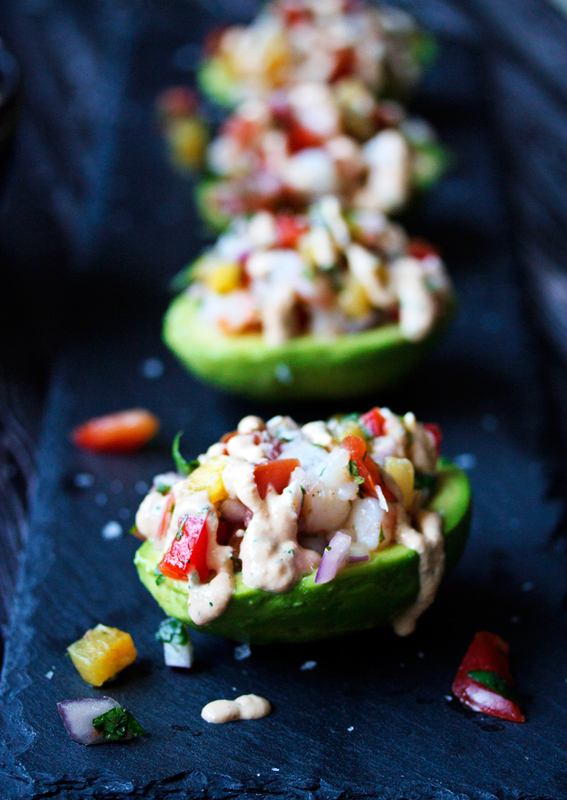 Slightly sweet from the pineapple, savory onions and peppers, salty prawns, zesty lime, creamy avocado, and all drizzled in a spicy cashew sauce. This is clean eating at its best. Such a fresh and healthy appetizer or light lunch. Even though these are super healthy and nutritious, they feel incredibly indulgent. 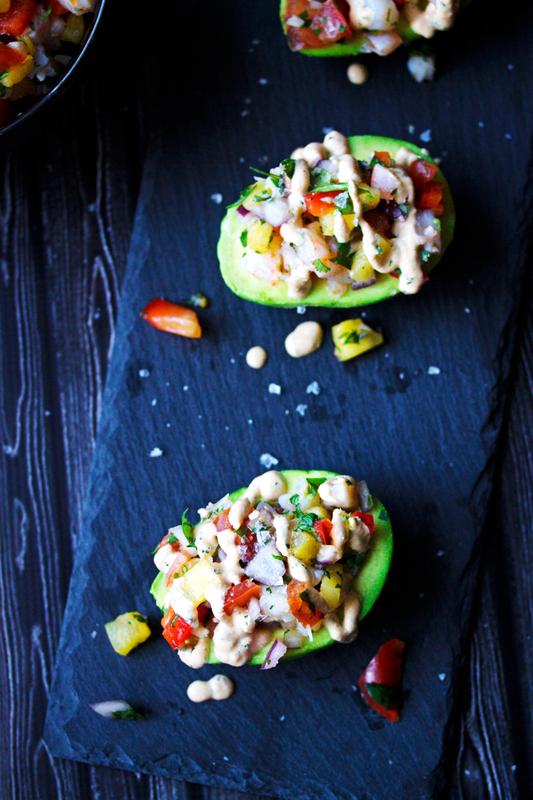 You could also keep the skins on the avocado when you serve them, but they are much prettier without. You have to make sure to really cover the avocado with lime so they don’t turn brown before you serve them. You might think, as I did at first, that there would be too much avocado here, but I was wrong. The ratio of salsa to avocado works perfectly like this. These are over the top delicious! We posted this Cashew Sauce a couple weeks ago. Its so versatile! Smooth and creamy, it can be flavored in any number of ways, but made a little spicy like it is here, its so perfect as a topping to this appy. I can’t wait to make these for my best girlfriends at one of our lunch or dinner dates. Give these a try and savor every bite! Heat the olive oil in a frying pan on medium heat. Chop up the prawns in small bite sized pieces. Add them to the pan and start to saute. Add the minced garlic, lime, salt and pepper. Saute until the prawns turn a bright pink, but don't over cook. Set aside to cool. Get out a big bowl. Add the chopped onion, tomatoes, red pepper, pineapple, cilantro, lime, and salt. When the prawns are cooled, add them to the salsa. Mix it all up well. Season with salt and lime to taste. Make the creamy cashew sauce with sriracha and cilantro according to the directions. When you are ready to serve the dish, slice the avocados in half and remove the pit. Gently scoop out the flesh with a spoon so that you have a full half an avocado. Cover each avocado in lime juice really well so they don't get brown. 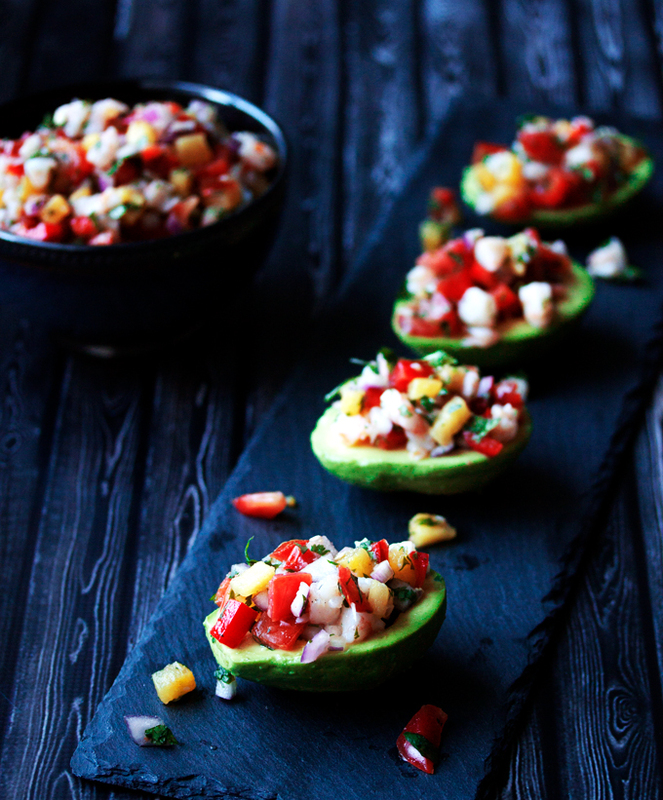 Scoop a couple spoonfuls of the the salsa onto each of the avocado halves. Drizzle cashew cream over top if desired. I am totally making these for lunch tomorrow. But without the prawn unfortunately. They will still be amazing without the prawns! You are going to love them. Oh yeah, so delicious! 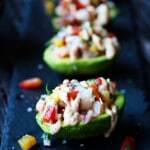 Avocado is so creamy, paired with all the other flavors you’ve got going on, AND that cashew creme, I can see how how this would be fabulous for lunch, or served as a side to enchiladas or tacos! The addition of pineapple is mouthwatering! Thanks ladies! Love this colorful recipe!